After Yesterday at Brookfiled CP, I was really keen to get out again and look LP EU on 20M, so I headed up to Mt Gawler – VK5/SE-013 this afternoon. It was a windy and threatening to rain, but got up there and set up both verticals again pointing at around 120Degrees. Got on the air just after 05:00UTC and found a clear frequency on 20M and posted a spot on sotawatch. A couple of VK’s responded and then a few EU stations started coming up. About 20 minutes into the activation the rain did come in and threaten to make it uncomfortable, but fortunately it only lasted 3 or 4 minutes. I'd say that your antenna is an unmitigated success! I had someone else in EU then start calling CQ over the top of me, but lasted only a minute or 2 – and then the floodgates opened for the next 30 -40 minutes and I suspect it was as a result of Ed posting a spot on the Cluster and in just over an hour, I had logged 45 contacts on 20M with 36 of them being EU DX! Again, I need to stress that I am just using the KX3 and only 10W – Yes, QRP power only and not running a big battery and a high-powered station. A highlight was to get VK4FO in the logs! he said there are only a few of us and when he saw my call on the cluster he just had to give me a shout – Thanks Gordon! Again, I set up the table between the 2 Verticals. I was able to use an exiting post to mount 1 of the antennas against and had to drive in a stake to support the 2nd one. Hopefully, next time I am there, I will be able to pick the same spot to set up. For the 70 minutes I was on 20M I worked the following prefixes. As always, I fired up on 40M before leaving and worked another 6 stations to finish this cold activation with 51 contacts logged. So yeah, this experiment of going back to a basic resonant antenna’s has been a real eye opener for me – as over the years I have used all sort of multi-band verticals and never really had much success with them. Yes, 2 elements on a summit are really a lot better than a dipole and Now I have to totally re-think my portable antenna’s and probably spend the next several month’s building antenna’s for other bands as well. I can see the weight going up with carrying more antenna’s. 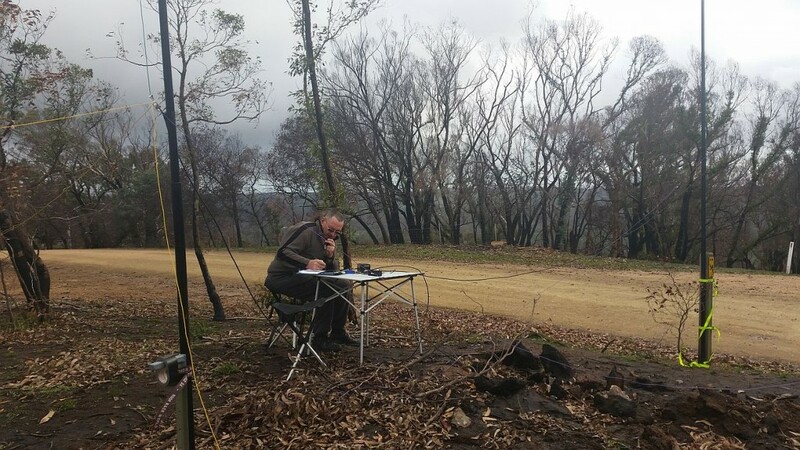 EDIT: I have just checked my logs – and this activation was my most successful sota activation of all time – with 51 contacts logged. Additionally, I added 3 new DXCC countries to my tally.